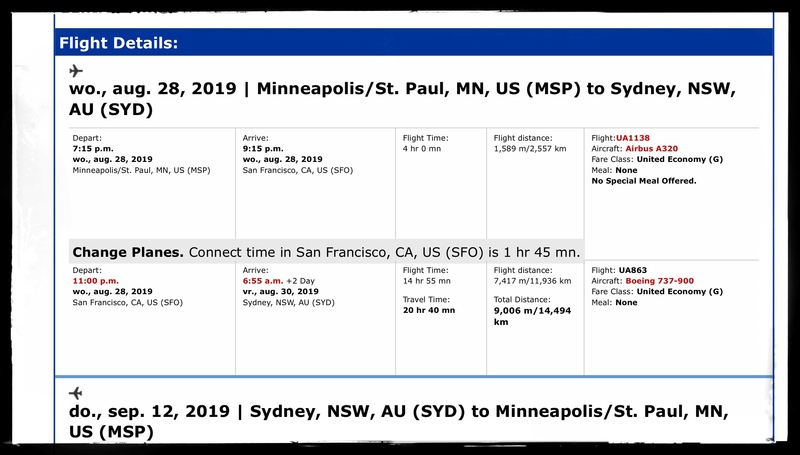 United is cutting back frequencies on the Houston-Sydney and Los Angeles-Sydney routes, but will maintain daily service on SFO-SYD during the Northern Hemisphere spring and summer travel season. They did this last year with the IAH-SYD flight, and this year the cut back is deeper, with just 4 x week service (IAH). I do not recall the LAX flight being reduced last year, but I could be wrong. Does not look like the planned SFO-MEL route (or the existing LAX-MEL flight) are impacted in terms of their planned frequencies. SFO is 4 x per week as announced and LAX remains daily. Not really surprising given the $400-$600 R/T fares recently promoted. LAX-SYD is very competitive, with QF, AA, DL, and Virgin Australia in the market, and IAH-SYD is a long, thin route. With DL/VA and on a de-facto basis QF/AA basically competing together on the LAX route, something had to give. Even if it's seasonal cuts. It was either out of UA or DL/VA to pair back. It ended up being the former considering UA had no Australian partner. IAH-SYD was 4x in August last year as well but the LAX reduction is new. This is smart capacity discipline by United cutting some frequencies in the low season to Australia when the aircraft can make much more money on TATL and then ramping both routes up to daily and adding SFO-MEL for the Southern summer when TATL traffic drops off. IMHO we will see more seasonal variation in Australia-USA in the future as, especially for the US carriers. AA said something to the effect that if the QF JBA was approved they would add seasonal routes to Australia in northern winter and then send that capacity to Europe for northern summer. Or maybe they bit off more than they can chew in their quest to fly all of these fancy ULH flights. Wonder how much money they anticipated losing if they actually flew these flights? Might actualy close the revenue gap with DL. I've said it from the very beginning, all these ULH flights that UA flies that UA fans oooh and ahhh over are whats probably causing them to fall significantly short in the revenue race VS. DL. Moves like this I can see definitely closing that gap. Going less than daily on LAX-SYD is a risk for ongoing market share for business travelers. It was probably a well calculated decision so they could use the plane elsewhere during the peak summer travel season. With 5 airlines serving the route now compared to only two in the past even Qantas has dropped down to one flight per day. Someone had to flinch. Houston to Sydney dropping is less of a surprise. The Australian Dollar is also very soft at the moment, so they are making less money from Australians. IAH-SYD was less than daily last year during the northern hemisphere's mid spring to mid fall, but LAX-SYD was still daily. I think you are correct reducing LAX is a calculated risk but I just did a few dummy bookings and I found airfares for $300 - $400 dollars one way (taxes included) on all carriers flying LAX-SYD. Whereas LAX-MEL airfares were around $700 - $1000 dollars one way. It would not surprise me if everyone is loosing money on LAX-SYD, and like you pointed out QF is also down to just one daily fight on this route, AA started this route with a 77W its now a 789. We've seen other airlines make adjustments to try and stabilize fares which so far hasn't worked during the slow season. The 789s UA is using on this route can be put to better use on other routes. This now answers the question (at least for the summer season) where the 789 for SFO-AMS will come from. However once LAX and IAH go back to daily in October UA will still need to find another 789 for SFO-AMS which is supposed to operate year around but UA isn't slated to take delivery of any 789s until 2020. On a quick side note Polaris installations on the 787-8/9s begin later this year. Well, LAX-SYD which has taken the brunt has been a fancy ULH non stop route for 44 years. More a tale of UA being poor at defending market share on a route that's one of the most established globally, it's been around for 70 years (UA and PA before the UA purchase in 1985). Probably doesn't help that UA doesn't have a partner at the Australian end, which AA and DL do. even Qantas has dropped down to one flight per day. Remember AA took over the second daily flight though. LAX frequency was maintained and total frequency/seats grew overall with the return into SFO as a result. This has nothing to do with loosing marketshare when ticket prices are around $600 dollars roundtrip. At that price UA can fill the aircraft but yield is trash. UA will still have a total of 14 daily nonstop flight to SYD from March to October and still maintains daily service to MEL where yields are much higher. Total seats in this market LAX-SYD did not grow QF on their second flight was using a 744 (I'm not sure if QF was daily double A380 SYD) but AA started with a 77W an is not down to a 789 frequency may have remained the same but seat count for sure dropped, also QF and AA are not JV partners. Without that JV partnership this represents a decrease in fact just last year both airlines stated they would be forced to reduce frequencies or routes if their partnership wasn't approve. Now I don't know if they were simply blowing smoke up the DOT's rear end to get approval or if they are serious that without a JV they would need to cut frequencies. Ticket prices have been falling for a while and with ticket prices as low as they are to SYD it would surprise me to see other airlines explore other options later this year or next year as well especially if UA's reduction doesn't stabilize tick prices on the LAX-SYD route. Finally. Something had to give here with a combination of over-capacity, a weak Australian dollar, and now RT US POS fares dipping below $600. Necessary capacity discipline. UA will still have a total of 14 daily nonstop flight to SYD from March to October. No wonder they’re losing money! The playing field to Australia will get tougher for UA with the impending QF/AA JV. I just got the change notification today and it saddens me as i was flying that route specifically to say i had flown SYD-IAH. But that's not all they changed. I was also notified that the outbound flight SFO-SYD will now be operated by a Boeing 737-900. LAX is going from daily to just 3x weekly during northern S19. Hard to imagine that in the past UA had 2x daily flights on LAX-SYD. In NW they had 10 weekly with 744s for several years, I don’t recall more than that. 3 weekly will be interesting, partly looks like so they can free up 2 whole 789s with IAH at 4 weekly. IAH-SYD is redundant and UA should keep daily LAX-SYD. NZ's IAH-AKL is well covered for the entire Australian market via AKL and route via SFO and LAX is another option. What I am thinking is maybe UA will reduce the capacity and eventually dehub at LAX. UA just moved SIN flight to SFO, reducing LAX-SYD to 3 weekly during the low season. Possiblely UA can move the NRT, PVG, LHR, MEL flights to SFO and let JV partners to do the heavy lifting at LAX. I guess it must be hard to maintain 2 full size hubs so close to each other at LAX and SFO while they kind of own SFO and LAX is shared with virtually everybody. It’s the Pacific version or AA’s Atlantic “fall” at JFK. I guess SYD could be maintained from fortress hubs IAH and SFO. Now LAX-SYD fights heavy competition with a UA poor frequency service while SFO sees more feed. I don’t see it lasting for long. LAX-MEL might last on its own while LAX is still a long haul base for UA. But I see the same pattern of pmUA at JFK-T7 regarding long haul. I agree totally as it would be better for the IAH-SYD aircraft during S19 to be redeployed on a higher yielding + shorter IAH-EU service whilst the reduced LAX-SYD aircraft too can instead be deployed to Western Europe such as launching new summer seasonal SFO-BRU or LAX-BRU nonstop services. LAX-BRU and SFO-BRU last year each had 45,000 round trip pax and no one flies it nonstop. Via BRU they can code share with SN to Africa and some EU destinations thus relieving some of the pressure from their FRA/MUC flights from West Coast. LAX-BRU-LAX is 21:45 hours round trip block time versus 28:50 flying LAX-SYD-LAX hence a big cost savings there ! Actual flown yield on SFO-BRU though was +35% higher versus LAX-BRU hence since demand levels are almost identical it would be commercially more beneficial if UA considered SFO-BRU 3wk nonstop with the reduced LAX-SYD aircraft iso LAX-BRU. Last edited by behramjee on Sat Feb 09, 2019 11:13 pm, edited 1 time in total. EWR-IAD are closer (212mi) than LAX-SFO (337mi), and they seem to do fine maintaining both EWR and IAD. As you say, I think the main problem with LAX is how highly competitive it is with all major US carriers having some form of hub operation there on top of all foreign carriers operating at LAX. Agree on over capacity. Cuts make sense. Can someone just not point it out? Are you requiring we give solutions to everything we point out? Goodness. Does not surprise me it's been a bloodbath of overcapacity especially during off-season. This is why QF wont be starting SYD-SEA anytime soon among other reasons. The part that does surprise me is the cut at LAX. This is a big deal, and shows the weakness that UA is facing at LAX in the competition arena at least in the long-haul flights. I tend to agree, in that UA has operated LAX-SYD continuously, for decades, with 747s (-200s, -400s), 777-200ERs, and then transitioned to the 787-9 in mid-2016. I think the reality is the competition and capacity at LAX vs. IAH. At LAX, UA competes on this route with QF, AA, DL, and Virgin Australia. At IAH, it competes with no one so that is why the IAH-SYD frequency is at 4 p/w vs. 3 p/w at LAX in the Northern Hemisphere spring and summer. UA has much more feed at IAH than it does at LAX. It does beg the question though of whether LAX for UA is not really fixable or worth fixing at this point. The 739 is operating. Fuel stop in HNL. , and folks here complain about Hawaii flights on the 737. It should be great, you can be the only passenger with that stage length, the rest of the cabin will be fuel tanks & you'll get upgraded for weight & balance. Last edited by RWA380 on Sun Feb 10, 2019 4:07 am, edited 2 times in total. All good points indeed. I almost think of UA LAX-SYD as a legacy route with a lot of history. If they had to drop it or move the capacity to SFO that would be an end of an era, but maybe a needed financial move. I think it’s just another sign UA is struggling to compete at LAX on legacy routes. DFW was another one they recently got rid of. To their credit, they’re trying new routes that are outside the box like MSN to make up for it. Sure they are adding some smaller markets from LAX, but dropping major markets is a bad sign. Hard to imagine that Star FFs in the LA area only get 3x weekly to SYD. 4-5x weekly would be more sustainable, but 3x weekly just seems too low if they want to capture any meaningful business/premium market. But I am sure UA ran the numbers and concluded that 3x weekly is all they can fly profitably. I think it’s just another sign UA is struggling to compete at LAX on legacy routes. I bet if you look at AA, DL, or any other airlines flying LAX-SYD in the same time period they’ll all look the same. Low loads, low yields. UA just has the network to spread out. DL and AA are confined to a single gateway, so they have to stick with it to maintain service no matter how ugly it gets. It’s not a failure to compete. There’s simply just too much capacity. I think there is some overreaction here. UA is still committed to these markets to Australia. They could have gone seasonal only with LAX and IAH/SYD, but they didn't do that, they are still in the market even off season just not daily; and SFO/SYD and MEL/LAX and MEL/SFO are still year round right? As others said just how much traffic is there to the southern hemisphere during their winter? Like UA was also struggling with what to do with IAD-GRU during the southern winter. It doesn't look like this is portending the end of UA's LAX hub either. Yes, UA has been in LAX-SYD forever, but it don't mean squat, things change, especially in this day and age, and to repeat they aren't leaving completely anyway. These are seasonal adjustments. But I kind of agree, UA should have stayed in LAX-DFW since it's a big market and an important one. FJs SYD/LAX via NAN used to always be the cheapest, but lately they haven't been. Told Fiji is booming, so maybe FJ doesn't have to cut fares to fill through traffic, when fares Australia & LAX & SFO to Fiji are holding up. If AA/QF JV is given ok, will BNE/LAX become daily, down from 10 a week ? Look around end Feb-Mar... The FJ fare is the cheapest at $880 (can probably find slightly cheaper on some sites) and have undercut NZ, but FJ tend to do this a lot in the off-seaaon. My take on the extra 3 QF flights is they will be substituted for another route eventually. Afraid not....that number shows a percentage of the week the flight operates not the number of days. ie 4 days a week is .6. All airlines flying OZ/USA return have been doing AU$900 type return fares including QF. My inbox gets about 3 or 4 emails a week, from various airlines trying to give away flights to USA. Some have 48 hour sales at these prices, then approximately 48 hours after sale ends, you get another email with similar fares & validity dates from same airline. Did read somewhere that BNE/DFW could be a possibility for the 3 extra QF BNE/LAX flights per week currently. This would make a lot of sense, for those going beyond LAX & into AA mega hub with final destination, almost anywhere in USA. Some freinds recently flew SYD/DFW/DEN which although backtracking, was just as quick as going via LAX & cheaper. Ah ok, Thanks for the correction.